Fresh from Florida Strawberries are known as Florida’s favorite winter berry! 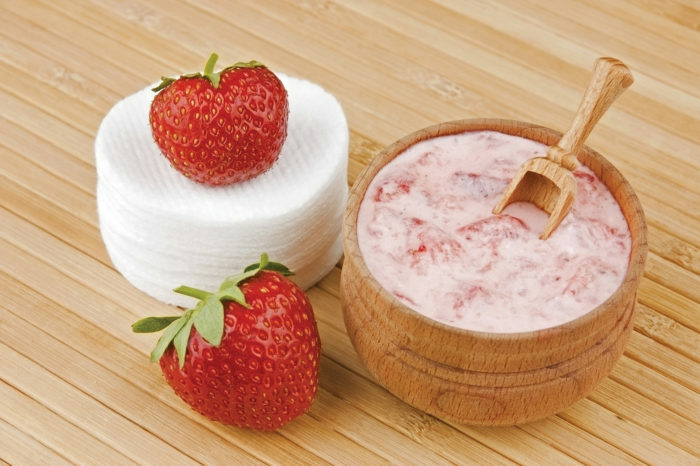 Strawberries are a natural astringent, try this scrub to exfoliate and rejuvenate your skin. Blend or mash 4 to 5 fresh strawberries with ¼ cup sugar and 1 tbsp coconut oil. Mix sugar and oil, then add mashed berries. To use, dampen your face and apply an ample amount of the strawberry scrub. Let it sit for a few minutes, then rinse with warm water. Moisturize. Mix in a blender 1 banana, 1 cup strawberries (fresh or frozen), ½ cup vanilla yogurt, ½ cup milk (replace with juice if desired), 2 tsp honey, 1 pinch of cinnamon, and 1 cup of ice. Blend 3 to 6 ripe strawberries and ‘paint’ your teeth with the mixture. Let it sit for 5 minutes. Then, combine 1 tsp of baking soda, 1 tsp of cream of tartar, and 1 cup of water. Swish this mixture in your mouth for several seconds. Then, brush your teeth with 1 tsp of baking soda and rinse with cool water. Mix 8 strawberries, 2 tbsp olive oil, and 1 tsp of kosher salt into a paste. Massage it into your feet, rinse, and pat dry. Moisturize. Mash 8 fresh strawberries with 1 tbsp mayonnaise. Massage into damp hair. Cover your hair with a shower cap and towel, and leave the mixture on for at least 10 minutes. Rinse and shampoo as usual. Combine the pulp of 3 ripe strawberries with 1 tbsp honey and 2 tsp lemon juice. Apply the mixture to your face, leave on for 10 to 15 minutes, and then rinse well. Moisturize. Chill large strawberries, then cut into ½-inch slices. Place largest slices over puffy eyes and leave for 10 to 15 minutes. Mix 5 mashed strawberries with 1 tbsp honey. Apply the mixture to your face, avoiding your eye area. Rinse mask after 15 minutes. Moisturize.